Created soon after the beginning of the Battle of Peleliu - the bitterest battle of the war for the Marines. 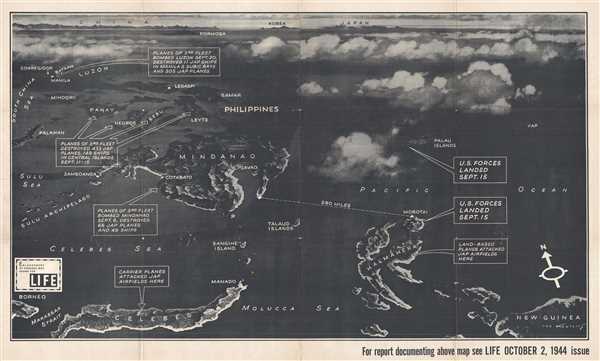 This is an enlarged, separate issue version of a 1944 Ted Kautzky map created for LIFE magazine. The map depicts the southern Pacific Ocean from Palawan in the Philippines and Borneo in Indonesia to New Guinea and from Luzon in the Philippines to Celebes and Halmahera in Indonesia. Hong Kong, Formosa, China, Korea, and Japan are illustrated in profile and labeled along the top border in an effort to place these South Pacific islands in the region. Individual islands throughout the region are labeled, including Mondoro, Panay, Negros, Cebu, Luzon, Leyte, and Mindanao in the Philippines, and Borneo, Celebes, Halmahera, and Morotai in Indonesia. Both Manila, Bataan, and Corregidor in the Philippines are labeled as well, names with which LIFE Magazine readers would have been familiar, after the fall of the Philippines and the infamous Bataan Death March two years earlier. American and Allied forces in the Pacific were divided into two separate operational entities. One, led by Admiral Chester Nimitz, was responsible for operations in the Northern and Central Pacific and concentrated their forces on the Gilbert, Marshall, Mariana, and Palau Islands, along with Iwo Jima and Okinawa. American and Allied forces in the South West Pacific theater were led by General Douglas MacArthur, and after being kicked out of the Philippines, fought their way back through the Dutch East Indies, the Solomon Islands, New Guinea, the Philippines, and Borneo. Campaigns which were part of both the Central Pacific theater and the South West Pacific Theater are referenced here. These battles, which were part of larger campaigns, are labeled on the right. Two different landings appear on this map, one at Peleliu and one at Morotai. Both of these battles began early in the morning on September 15, 1944 and would serve as a step toward the liberation of the Philippines, which would begin in late October with the American landings on Leyte. Numerous other actions taken by American forces in the region are labeled, all of which were air raids on various targets in Indonesia and the Philippines. The Battle of Peleliu was part of the larger Mariana and Palau Campaign in the Central Pacific. A five square mile island in Palau, a Japanese garrison of 10,900 soldiers had fortified the island and were prepared for the American landings. They constructed a system of interconnected heavily fortified bunkers, caves, and underground positions in a 'honeycomb' design. American commanders believed that Peleliu would be secured in four days, but, due to the new tactics and fortifications of the Japanese garrison, the battle stretched on for more than two months. Known as 'the bitterest battle of the war for the Marines', American troops suffered over 2,300 killed and 8,400 wounded during the fighting. The 1st Marine Division, which bore the brunt of the fighting, suffered over 6,500 casualties, or more than one third of the division. The Division was out of action until the invasion of Okinawa on April 1, 1945. Of the 10,900 Japanese soldiers garrisoned on Peleliu, only 19 were captured by American forces. The Battle of Morotai was not nearly as brutal or as costly as Peleliu. The landings at Morotai were uncontested, and American troops did not meet much resistance in the two weeks before the island was declared secure on October 4. U.S. casualties numbered 30 dead, 85 wounded, and one missing, while Japanese casualties totaled over 300 dead and thirteen captured. Japanese resistance on the island did not end on October 4, however. The Japanese continually reinforced their troops on Morotai, but with little success. Japanese troops on Morotai suffered from disease and starvation and, even at their highest troop levels, were never truly able to create much of a counteroffensive. Nonetheless, small raids by Japanese troops against American positions continued on Morotai until the end of the war. This is a separate issue enlarged version of a map was created by Ted Kautzky for LIFE Magazine. The smaller version of this map was printed in the October 2, 1944 issue of LIFE. Theodore ‘Ted’ Kautzky (1896 - 1953) was a Hungarian born watercolorist known for his landscapes and marine scenes. Born in Budapest, Kautzky studied architecture at the Royal University of Hungary and graduated with a degree in architecture. In 1923, at age 27, he emigrated to the United States where he found work as an architect for the New York City Parks Department. Eventually, his skills as an artist became known and he began teaching art. He was a sought after instructor for the Pratt Institute, New York University, the University of Toronto, and the University of Pennsylvania. Kautzky spent more than a decade painting scenes of Cape Ann, Massachusetts, where he earned membership in the Lockport Art Association, the North Shore Arts Association, and the American Watercolor Society. He was also a noted art instruction author and his book, Ways with Watercolor, has nourished the careers of watercolorists worldwide. Very good. Wear along original fold lines. Verso repairs to small tears. Blank on verso.